According to DHL’s latest quarterly issued “Global Trade Barometer,” (GTB) the growth of world trade will lose momentum. This is mainly caused by unpredictable political and economic risks fueling negative expectations, dampening the investment climate. In Q1, 2019, growth rates in both, air and ocean trade have gone south. The respective global index value for air trade has declined on average by -4 to 55 points in total. The growth rate for global ocean trade has decreased by -5 to 56 points. Despite the lasting tariff tensions between the U.S. and China, the outlook for Chinese trade decreased only marginally, by -1 to 56 points. The finding indicates only small trade growth but excludes a downturn. In contrast to China, the U.S. trade suffered a decline of -5 to 55 points in comparison to the previous GTB. This puts them roughly on a par with China in terms of predicted trade growth for the next three months. In the December issue of the Global Trend Barometer, India and South Korea were the countries with the most impressive growth of their trade. That is over. Latest data prove that both countries account for the highest and second-highest overall index losses, respectively. Seen by South Korea’s record losses of -12 points, sliding from moderate trade growth into stagnation and from the second highest to the lowest GTB score, now standing at 49 points. Even worse is the decrease of India’s forecasted trade growth that experienced a steep fall of -18 points. According to DHL’s market observers, this is mainly due to the country’s very weak ocean trade, whose index dropped by -20 points. Despite the losses, India maintains the highest predicted trade growth of all GTB countries (now scoring 59). But only due to the general decline of confidence in world trade, leading to weakened forecasts. DHL’s GTB continues to forecast only a slight growth for U.S. trade as the index hits 55, representing a decrease of -5 points compared to the previous release in December. U.S. air trade is expected to come close to a stand-still, dropping -2 points to an index of 53. Ocean trade also shows signs of a slowdown. Air freight is expected to be dominated by imports, outshining the contracting growth of exports. High Technologies keep standing on top of all products imported into the USA that show growth, air imports of Land Vehicles & Parts is predicted to further decline, along with the Basic and Industrial Raw Materials. In contrast, air exports tend to decline further, affected by the negative outlook of Land Vehicles & Parts, High Technology, Industrial Raw Materials, Temperature or Climate Control goods, and Machinery Parts. Regardless of the ongoing Brexit discussions along with the fear of a potential recession, the outlook on British trade growth remains positive at a level of 54 points (+2), indicating a very moderate growth of international trade but no decline, as feared by many. However, this development is likely to be driven by re-stocking of goods in the run-up to Brexit. So it’s no real growth in trade but some kind of precautious measures leading to the temporary upswing in trade evoked by Brexit. Also, Germany’s trade index has improved by +2 points to 53 points. The foreseen moderate growth for Germany is mainly based on the forecast for German air freight exports which are up +9 points. This trend is most likely a reaction to growing transatlantic trade, despite President Trump’s ongoing threats to impose high tariffs on Germany produced cars, exported to the USA. 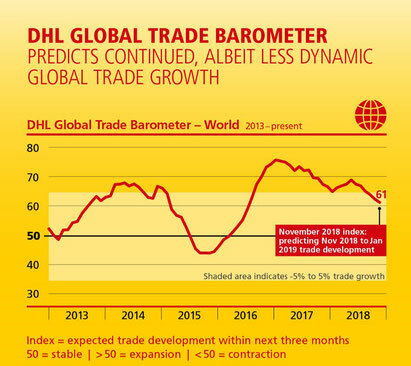 An updated version of DHL’s Global Trade Barometer will be out at the end of June. A loss or going under . If it's true to open up a ramp operation at Heathrow ??????? In a reaction to your previous comment re DHL/Heathrow we had suggested to get in touch with their press department directly to obtain the information requested. As a matter of fact, we do not know of any DHL ramp projects at LHR.